Zip-Chem specializes in the production of chemicals for the manufacture and maintenance of civil and military aircraft brand. Its range of products for the aviation sector includes lubricants, corrosion inhibitors (CIC), cleaners, sealants, adhesives and solvents. Sensitive to environmental concerns and the importance of weight control in the aviation sector, Zip-Chem eligible to reduce volatile organic compounds (VOC) not affect the ozone layer and maintain the standards of air quality and designed to its chemical specialties and South-Prep, Aero-Lube, Calla or Cor-Ban, can be applied in thin layers to achieve the lowest possible weight while maintaining the degree of efficiency. 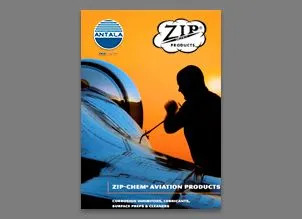 Zip-Chem is the company producer of the best aircraft chemical products-lubricants, CICs, cleaners, sealants, solvents and adhesives. These products for the aviation industry, requires special expertise in formulating and delivering product. Sur-Prep is a line of avionics and general purpose surface preparation cleaners. Sur-Prep products offer specific performance advantages in cleaning efficiency, flammability, VOC’s and other related environmental concerns. The Aero-Lube line of aircraft lubricants includes multi purpose greases, silicones, Teflon, molybdenum disulfide, and graphitelubricants. Special purpose Aero-Lube products are available for high temperature areas, applications requiring penetrating lubricants and prevention of ice build-up on rubber seals. 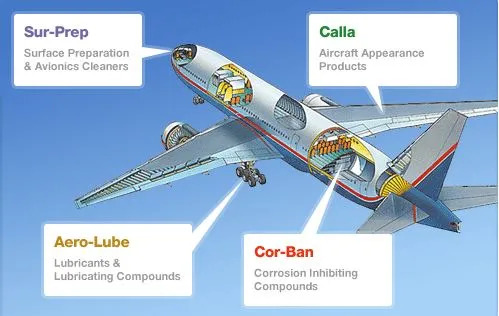 Calla products are aircraft cleaners. Several different products are available for interior and exterior cleaning. These include large surface cleaners for the exterior of the aircraft, parts cleaners, glass cleaners, degreasers, drywash and polishing products. The Calla line also includes disinfectants, odor neutralizers and EPA DfE approved cleaners including Calla 301A Exterior Wash, X-410Q Interior Cleaner and X-405 Window Cleaner. Cor-Ban is a line of corrosion inhibiting products specifically formulated for the demanding specifications of aviation maintenance. Cor-Ban products are for use on large structural components, small parts, avionics and cables. In addition, there are Cor-Ban formulations for heavy-duty use and long-term storage.